* Hard: missing a deadline is considered a system failure. Examples of hard real-time systems: airplane sensor and autopilot systems, spacecrafts and planetary rovers. * Firm：treat information delivered/computations made after a deadline as invalid. Like soft real-time systems, they do not fail after a missed deadline, and they may degrade QoS if a deadline is missed (1). 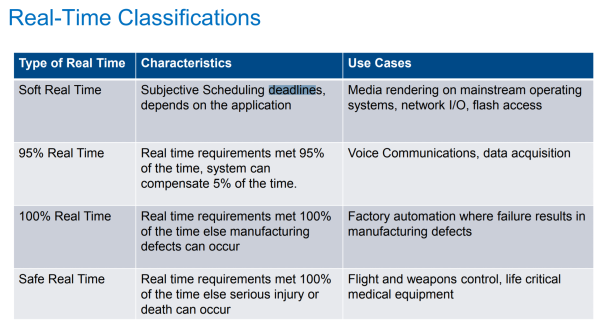 Examples of firm real-time systems: financial forecast systems, robotic assembly lines. * Soft: try to reach deadlines but do not fail if a deadline is missed. However, they may degrade their quality of service in such an event to improve responsiveness. Examples of soft real-time systems: audio and video delivery software for entertainment (lag is undesirable but not catastrophic). 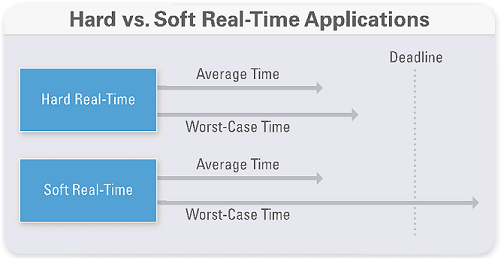 Neither deterministic user code on a non-real-time operating system or nondeterministic code on a real-time operating system will result in real-time performance. Simulation: What would happen if i use a non-real-time system?